This season Vince Dunn has set a career high in both goals and points with 11 and 33, respectively, but it is his advanced stats that have been truly outstanding. His puck possession, as measured by Corsi Percentage (CF%) is a phenomenal 55.5 percent, meaning the St. Louis Blues control around 56 percent of the play while he is on the ice. In a league, and especially a division, with great parity, that sort of control can shift a game or a playoff series in a team’s favor. The Blues should reward Dunn’s excellent play with an expanded role on their defense corps. Dunn combines great vision and an excellent shot to create numerous offensive opportunities for himself and his teammates, but his game is really built around his skating ability. He combines a fluid stride, dynamic agility, and surprising strength on his skates for someone his size. This allows him to create separation for himself in the offensive zone and make strong recoveries in the defensive zone. Dunn uses his strength in his own zone to maintain possession of the puck and break out. In the neutral zone he accelerates to break clear of the Leafs player and gives himself space in the offensive zone to snipe a goal past Leafs goaltender Frederik Andersen. This is such an impressive play for a rookie to make in overtime against a quality Leafs team, not to mention it was his first time playing against the team he grew up watching. It showcases a certain swagger with the puck and his ability to break the puck out of the zone with his skating. Is Vince Dunn Destined for Stardom? Dunn’s play brings to mind thoughts of another “small” defender who uses his skating ability and strength to great effect, Chicago Blackhawks’ future Hall-of-Fame defenseman Duncan Keith. A great stat for measuring a player’s impact in terms of creating opportunities for their team versus limiting opportunities for their opponents is expected goals percentage (xG%), which takes into account shots, shot selection, and distance to predict the amount of goals a team should be scoring. The below bar graph plots Dunn’s and Keith’s xG% at a similar age using data from Moneypuck.com. Data was available starting in 2008-09, so the chart displays that season and 2009-10 for Keith, which were his 25 and 26 year-old seasons, respectively. Dunn’s data is from 2017-18 and 2018-19, his 21 and 22 year-old seasons. Dunn has a much higher xG% than Keith, but this is just one statistic which shows whether a player’s team generates more quality shots while they are on the ice than their opponents. It does not take into account the quality of the competition or whether a player is put into a more favorable position. To add a little more flavor, I created the below chart using data from Natural Stat Trick that displays the even strength average CF%, high-danger chances percentage (HDCF%), scoring chances percentage (SCF%), average percent of offensive zone starts (Off. Zone Start%), and average time on ice (ATOI) for both Keith and Dunn during the same two seasons as above. These advanced stats were not available for Keith’s first two seasons in the league, so he is actually 24 and 25 in these two seasons versus 21 and 22 for Dunn. 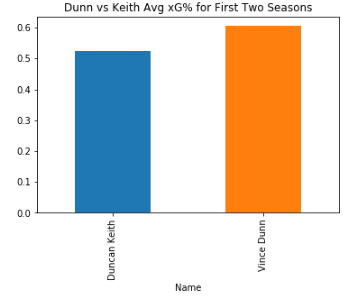 Dunn performs well in his first two seasons compared to Keith in all of the advanced stats. What is clear, however, is that Keith’s team trusted him with significantly more even strength ice time and with more defensive responsibility. This was shown by the percentage of time he started in the offensive zone being significantly less than Dunn. Given this all important caveat, we cannot simply anoint Dunn the next Keith. Dunn could crumble playing against better competition in a more defensive role or he could simply produce worse results with a higher workload. 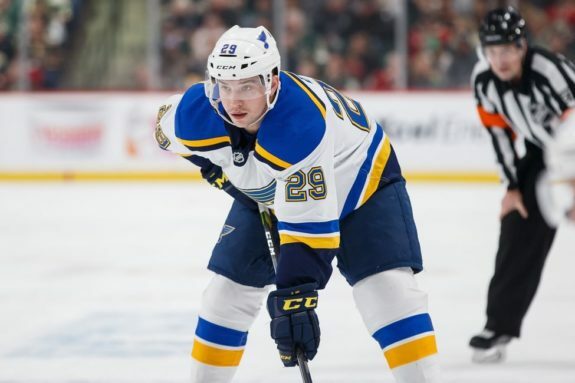 However, good things happen for the Blues while Dunn is on the ice and he has shown enough in the time he has been given to earn an expanded role on the Blues defense. The Blues are a much better team than the Blackhawks were in Keith’s early years, however, it cannot be underestimated the growth Keith saw in his game because he was trusted with a lot of minutes. 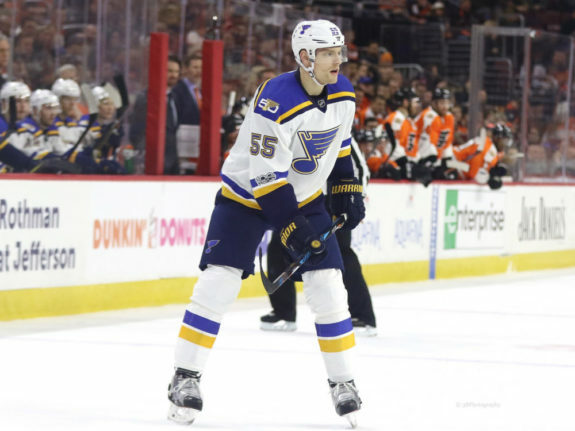 The Blues have recently promoted Dunn to play with captain Alex Pietrangelo full-time. However, this has been more out of necessity following an injury to Pietrangelo’s partner Joel Edmundson than based on Dunn’s play. In fact, Dunn has seen relatively flat ice time from his rookie season to his sophomore season despite an increase in play. While playing with Pietrangelo is certainly a good opportunity for Dunn, the data tells a story that a pairing of Dunn and Colton Parayko might be the optimal personnel decision. While Dunn and Parayko have played together, they have caved in other teams with a CF% of 54 percent and an xG% of 61 percent. Edmundson and Pietrangelo have also done a good job of controlling possession and chances while they are paired together with CF% of 53 percent and xG% of 55 percent. Combining these two pairs and giving them each upwards of 22 minutes of ice time a game could allow the Blues to tilt the ice for a significant portion of a game. A dominant puck possession game would go a long way towards helping the Blues make a long playoff run.